RJO’s copy of Donald Culross Peattie’s An Almanac for Moderns (New York, 1935) includes this T.L.S. 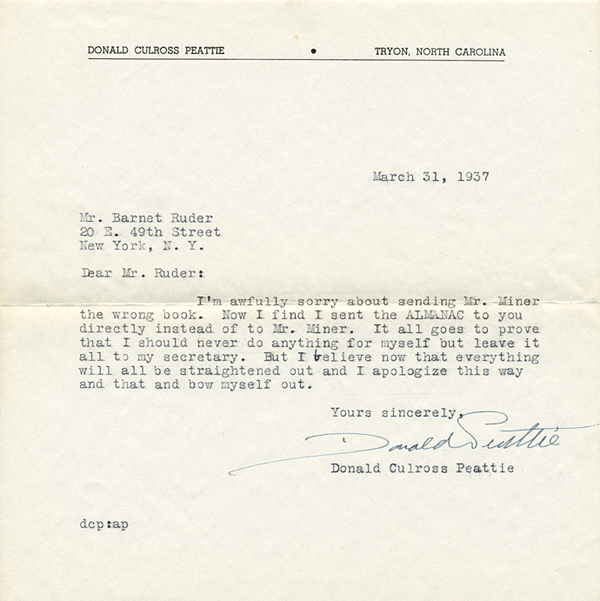 dated 31 March 1937 from Peattie to Barnet Ruder of New York apologizing for a mixup in presenting the wrong copies of his books to Ruder and to a Mr. Miner. (Perhaps Roy Miner?) The volume is inscribed on the front flyleaf, “Elmer W. Smith | XII-16-1942.” Donald Culross Peattie (1898–1964) was one of the most popular nature writers of the mid-twentieth century. A native of Chicago, he drew extensively on his experience of the Illinois landscape in his many volumes, some co-authored with his wife, Louise Redfield Peattie, who was herself a naturalist and popular writer. Peattie’s other works include A Natural History of Trees of Eastern and Central North America (1950) and A Natural History of Western Trees (1953).